A year after announcing the plan, Tesla is finally working on Gigafactory 1's rooftop solar array. In January 2017, Tesla revealed it wanted to outfit its Gigafactory 1 in Nevada with a 70 MW rooftop solar panel array — by far the biggest of its kind in the world. For more than a year after the announcement, the company stayed quiet about it. Now we finally have evidence that the company has started construction. 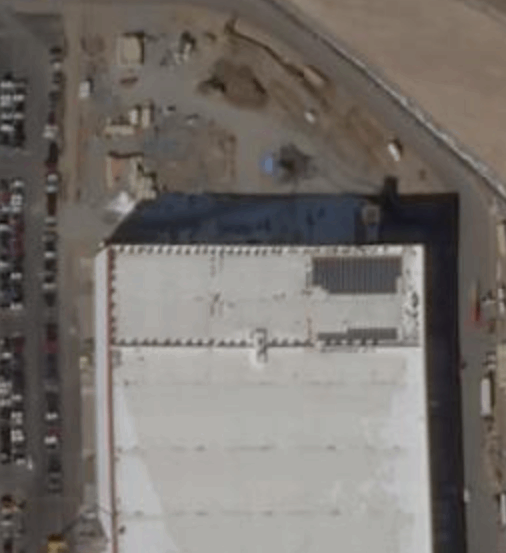 Satellite images posted by image archive blog Building Tesla show that a small section of the Gigafactory’s enormous roof is already covered by solar panels. The array’s long-awaited construction is exciting, but we still have some questions. Here are some of the most pressing. Why did it take Tesla so long to get started? We suspect it’s mostly because the company has other projects competing for time and resources. Throughout 2017, Tesla filed 112 building permits, property-focused site BuildZoom reported in early February. 50 of those permits were for add-ons to previous structures, such as a cooling system and microgrid lab. New constructions included: a metrology lab, a brazen oven to automate metal joining, hot oil skid systems to store and transfer heat fluids, and air separation yards to separate atmospheric air into elemental components. Gigafactory 1 is also where several key parts of the Model 3 are produced. Production issues that have plagued the vehicle could have also slowed the array’s construction. When will the solar panel array be finished? We have no way of knowing. But if CEO Elon Musk and the rest of the higher-ups at Tesla have proven anything in the past, it’s that they can complete monumental tasks in a relatively short time. Remember that huge 100 MW battery in Australia? That took just 100 days to complete from start to finish. Gigafactory 2 in Buffalo, New York, has been producing solar panels for several months now. Though we don’t know if some of those panels are going to Gigafactory 1, we can speculate that if they are, that production flow will likely speed up the process. Will the company use its own powerpacks to store energy? It would make sense. Tesla already uses its battery packs for its solar panels and solar roof products, so why wouldn’t the company use its hardware for its most important factory? According to Electrek, Tesla claims to have improved the efficiency and production of their battery packs. Now, Gigafactory 1 can supposedly produce 105 GWh battery cells and 150 GWh battery packs. If this is true, and if Gigafactory 1 is to play a notable part in Tesla’s goal to “transition the world to sustainable energy,” it’ll probably rely on products that it knows will work best: its own. How much has Tesla invested into Gigafactory 1? Musk has dumped a significant amount into the all-electric factory. As of February 2018, the factory’s construction costs have topped nearly $1.3 billion, according to BuildZoom. That total will undoubtedly climb following the solar panel array’s completion, and once again if Musk builds an underground tunnel to further boost production. No company has ever embodied the expression “you have to spend money to make money” more than Tesla. The company ended 2017 with a quarterly loss of $675 million, yet it continues to spend, undaunted. Musk seems confident that pouring millions into making his ideas a reality will at some point generate revenue. Tesla is not ready to slow down anytime soon, so expect to hear more about the company’s projects and production woes this year. Hopefully, in that time the company will course correct and finally put its Model 3 troubles behind. Editor’s Note: This article has been updated to clarify the Gigafactory’s role in Model 3 production.